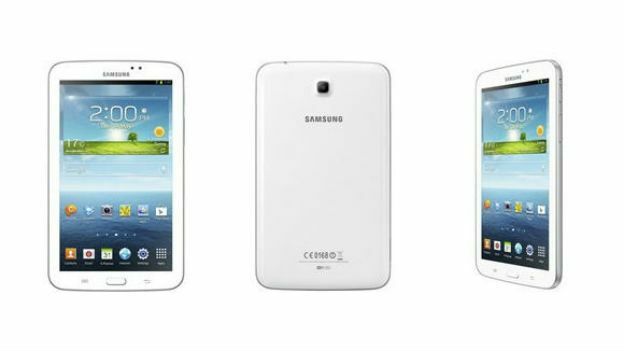 Samsung has announced its latest product today in the form of the 7-inch Samsung Galaxy Tab 3 Android tablet. If you're having trouble keeping up with Samsung's Galaxy team sheet, we don't blame you. The new addition is an update from the Samsung Galaxy Tab 2 and boasts a 1.2GHz dual-core processor, 1GB of RAM and Android 4.1 Jelly Bean on board. There's 16GB of internal memory and Samsung has added a microSD slot for expanding the storage. The Tab 3 has been fitted with a 3MP rear-facing camera and a 1.3MP front-facing camera. Samsung hasn't changed the resolution of the 7-inch display from the 1,024 x 600 of the Tab 2, but some of the weight has been cut down. The Tab 3 weighs in at 302g for the Wi-Fi model and 306g for the 3G version. There's a 4,000mAh battery inside the Tab 3, but at 9.9mm thin, it won't take up much space in your bag. No pricing information has been released yet, so we can't see how the Tab 3 will stack up against the likes of the Google Nexus 7 by Asus or the Amazon Kindle Fire HD. Samsung has indicated the Tab 3 will be available in its Wi-Fi mode by the end of May, while the 3G model should arrive some time in June. Stay tuned to T3 for the full review.